Live a unique experience! Fly high! 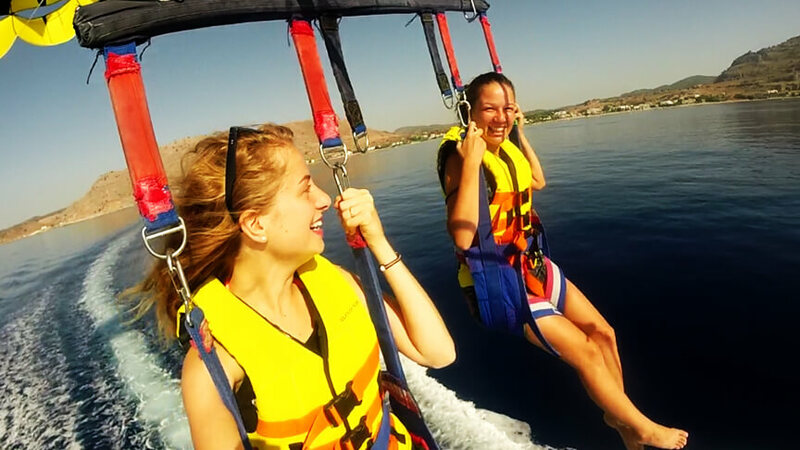 Feel the wind and enjoy the panoramic view of the deep blue and Lardos Bay. And all that without getting wet at all. Our brand new parasailing boat allows you to take off and land back on it completely dry. You don’t need experience or a special uniform. It is very exciting and appropriate for anyone. Our excellent equipment and our experienced crew will offer you an amazing flight. You can fly alone or even better with company up to three persons at the same time depending of course on the weight and the conditions. Kids from even 4 years old can fly together with their parents and from 10 years old can fly even without an adult depending on their weight. There is also the option for your family or friends to join you on board and watch you as passengers on the boat enjoying a pleasant ride. Don’t miss the chance to try Parasailing in Rhodes island. Our brand new boat is ready to offer you an unforgettable experience! * Min weight 50kg - Max weight 200kg. Weight limits can vary according to weather conditions. Yes, Parasailing is extremely safe. 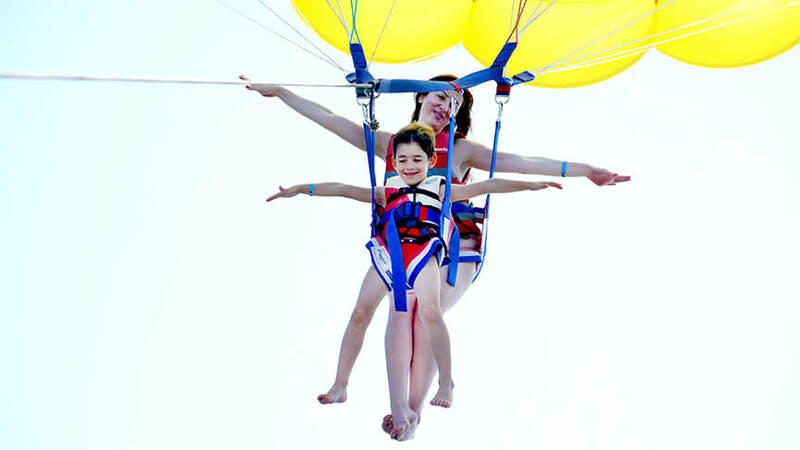 Parasailing is an extreme sport and it does carry risks. However, our captains and crews with more than 25 years of experience are specially trained to minimize or avoid such risks. We have flown 1000’s of participants and have maintained a perfect 100% safety record. Your safety is our number one priority. Prior experience is not necessary. The captain and assistant do ALL the work for you. You just have to come prepared to have a good time. 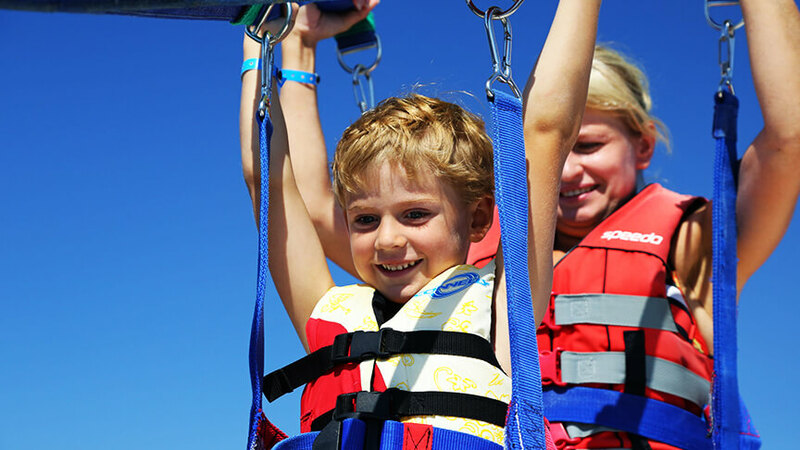 After getting outfitted with a life vest and harness, you're seated on the flight deck of the boat. Once seated the assistant clips your harness to the parachute. The captain then pushes a lever and up you go real nice and smooth, just like sitting on a swing that slowly lifts you up for the experience of a lifetime. All take offs and landings are done from the boat. No, you don't have to get wet if you don't want to. 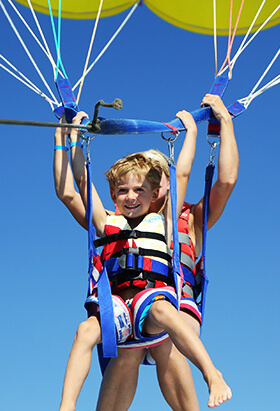 Our way of flying is called controlled parasailing, meaning you take off and land smoothly right from the back deck of the boat. If you opt for it, there is a fun wet part towards the end of your flight. The captain slows the boat down and has you gently freefall, dipping your feet in the water for a refreshing splash. He then lands you back safely on the boat deck. We recommend you leave behind anything that is likely to get damaged by contact with water or anything that is very expensive or otherwise difficult to replace. This would include your mobile phone, camera, and your 200€ sunglasses. The captain will hold onto your car keys, phones, etc while you’re on board if you like. 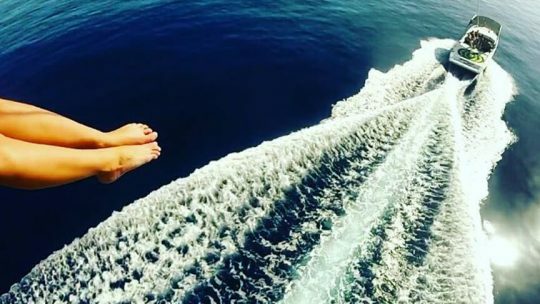 No shoes allowed on the boat. Αn extra person can follow you on board during your trip, to take photos etc... However, if there are more seats available, more people can join you upon request. 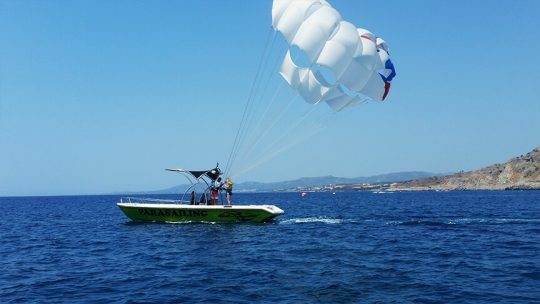 I had a great experience parasailing with Water Sports Action. My girlfriend and I was taken good care of by a great crew. They all seemed like fun and welcoming people. Really good service too. Highly recommended. It was really fun parasailing too and with the option to have a GoPro with you, which is delivered by DVD, I can re-experience it over and over again. Great experience. Very experienced staff. Parasailing was a blast. Recommend this water sports crew. This team are highly efficient, friendly and professional and I'd definitely recommend them. The kids were reluctant to go initially so they went on the Sofa round the bay. 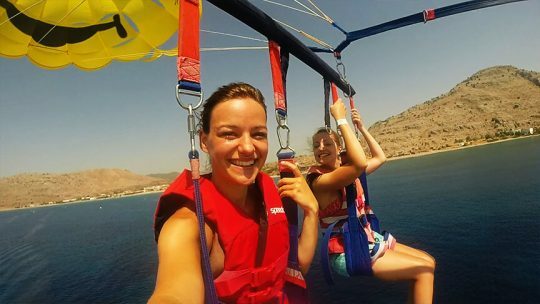 They enjoyed so much they then went parasailing, with a hired go pro (10e plus a disk), brilliant memory. And we got to go on the boat with them. Parasailing was very great. It was amazing. I would like to do this again. Thank you very much!!! !